2017 will see even more IoT devices introduced into business networks, along with an increasingly mobile workforce enabled by cloud applications and services. This rapid evolution of the workplace necessitates a re-look at where the security industry should focus on, in the ongoing battle against cybercriminals. As 2016 comes to an end, our Security Intelligence team have compiled a list of the top security predictions for 2017 and beyond. 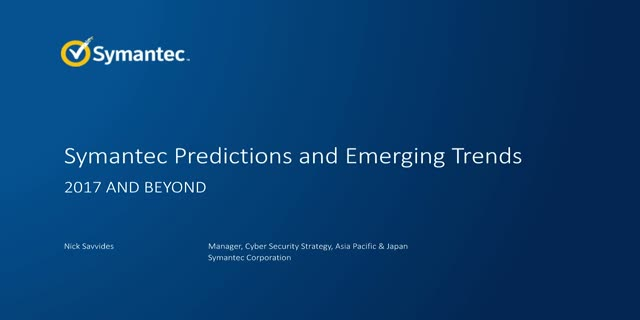 Attend our ‘Security in 2017 and Beyond: Symantec’s Predictions for the Year Ahead’ webinar and join our discussion of the upcoming threat landscape.